It’s so easy to embed video in WordPress these days, but it’s not so easy to create a video gallery listing all your videos in a grid – unless you use the right plugin. This article will teach you how to create a responsive WordPress video gallery using the Posts Table Pro plugin. Create your dynamic video gallery now! We’ll also look at the many different options for setting up your WordPress video gallery: you can choose which columns to display, column width, how many videos to display in each page of the gallery, and much more. Your WordPress video gallery will be fully responsive and will resize to fit different screen sizes and mobile devices. At the end of this tutorial, you’ll know how to create a professional-looking video gallery for your WordPress website. 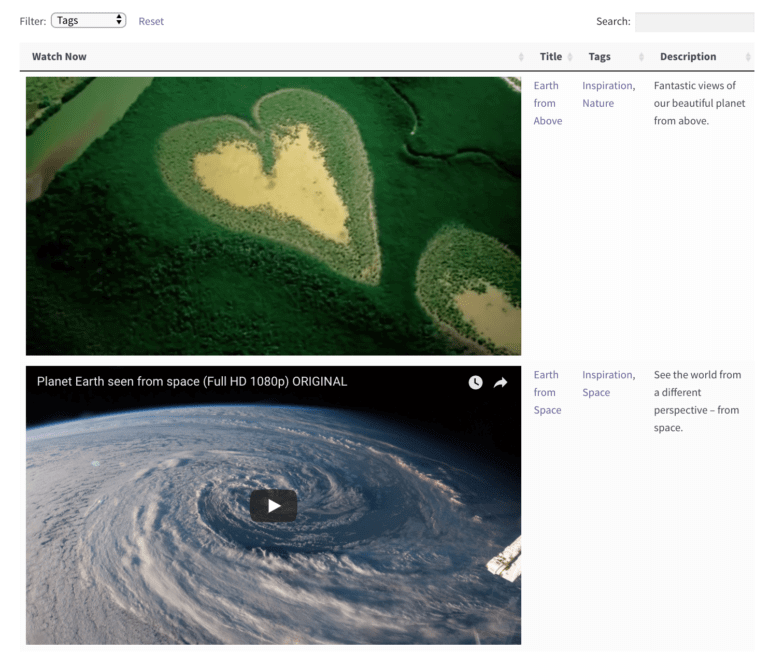 Your visitors will be able to watch videos directly within the video gallery, as well as search and filter to easily find their ideal videos. You can add a video gallery to any WordPress website with any theme. The only essential video plugin is Posts Table Pro, which you need to create the video gallery online. Download this now and install it on your site. You’ll be using Posts Table Pro to create a searchable, sortable video table, but first you’ll need to add your videos and video playlists. This means you need to choose how to store the videos that appear in your gallery. The Posts Table Pro plugin works by displaying posts from your WordPress website – these can be standard posts, pages, or custom posts. So you’ll need to add your videos within posts, pages or a custom post type. 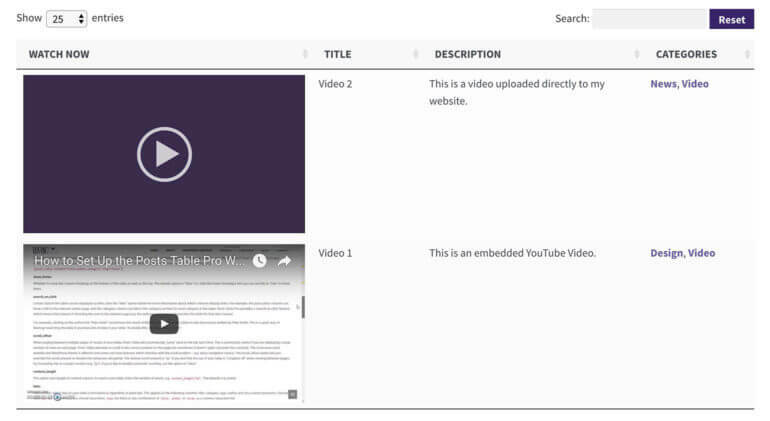 Note that you’ll be able to include a combination of individual videos and playlists in your WordPress video gallery. In the screenshots and video for this tutorial, I use a Video custom post type. This is the easiest way to organize your videos as you’ll have a dedicated area for storing videos in the WordPress admin, so I recommend setting up a Video custom post type before proceeding to step 2. If you’re a WordPress developer, then you can create your custom post type programmatically. If not, I recommend the Custom Post Types UI plugin. This makes it really easy to create custom post types in WordPress, without any technical know-how. Once you’ve installed Posts Table Pro and planned the structure for your video gallery behind the scenes, the next step is to add your videos to your website. Go to Video → Add New (if your custom post type is called Video. If not, add a new post using your chosen post, page or custom post type). The most reliable way to add video to your WordPress video gallery is to first host it on a third-party specialist video website. YouTube and Vimeo are the most popular, but you can embed from any of the files in this list. You get lots of extra features from specialist video hosts such as view counters, social sharing, annotations, mobile-friendly cards, monetization through advertising, etc. If you use a public video website such as YouTube then people can also find your videos directly via the host. This will help to increase your traffic. If you’d rather your video gallery not be publicly available on the hosting site, then I’d recommend Vimeo. Vimeo has more privacy settings and you can protect Vimeo videos so they can only be viewed on your domain. Then, simply paste the URL into the content area of your WordPress post. WordPress will instantly convert it into an embedded video player. If you’re using the Classic WordPress Editor, click the Add Media button above the WordPress toolbar and upload your video file (e.g. MP4 or MOV). If you’re using Gutenberg, insert an ‘Audio’ block. Make sure the Attachment Display Settings section is set to Embedded Media Player and click Insert into post. Click Add Media above the WordPress toolbar if you’re using the Classic Editor; or add a ‘Playlist’ block if you’re using Gutenberg. Click the Create Video Playlist option on the left. Note, this option will only appear if you already have video files in your media library. Click the Create a new video playlist on the right. On the next screen, add the caption that should appear for each video. Tick the boxes to indicate whether to show the video list and images in the playlist. Then click Insert video playlist. You can use the standard WordPress functions to set up any categories or tags for your videos. Information added to the main post content with the embedded video, will appear in the same column as the media player, which isn’t ideal. So any other information, such as text or buttons, is best stored in the Excerpt or a custom field. This will ensure the information can be displayed as separate columns, and that it’s sortable and searchable. Later in this tutorial, I’ll show you how to create a WordPress video gallery with columns for title, content and excerpt. If you want to copy the exact shortcodes I use in this tutorial, you’ll need to add the video within the main content, add a description in the Excerpt field, and also structure your videos into categories. But you can use the knowledge base to add other column types, including custom fields. If you do this, note that your shortcode will be different from my examples below. Tip: I recommend the Advanced Custom Fields WordPress plugin to create custom fields for storing data about your videos. For example, using the Advanced Custom Fields plugin you can easily create custom fields to add video lengths and ‘Buy now’ buttons, then display these as separate columns in the video gallery. Once you’ve added any further information, click Publish for all your video posts. 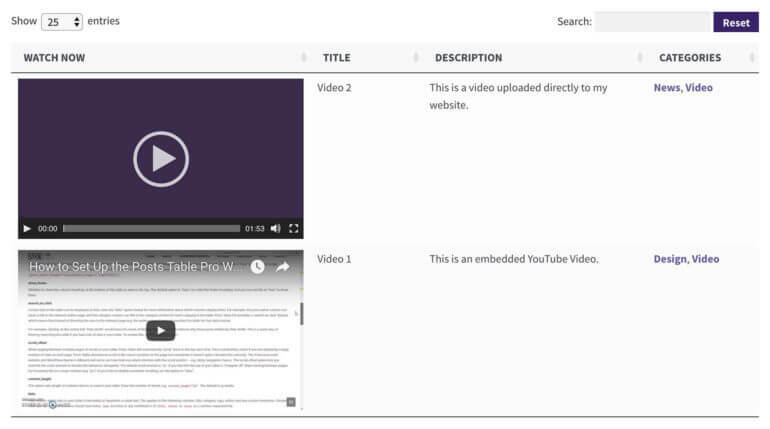 Now all your videos are ready to go, you’re ready to display your WordPress video gallery! Replace the ‘video’ in post_type=”video” with the slug for your custom post type, or ‘page’ if your videos are on pages. If your videos are on standard WordPress posts, you can ignore the post_type element of the shortcode, as posts are displayed by default. In this shortcode, I’ve added a colon after the content and title columns, followed by the text I want to use as my column headers. This will rename the content column to ‘Watch Now’, and the excerpt column to ‘Description’ – while keeping the default names for the title and category columns. You can do this for any column to customize the title in the header row. Update your page and see how your WordPress video gallery looks now. You’ll see the categories are now much more relevant and user-friendly. You can click on a category to filter by the videos in that category. You can also type a keyword into the search box or click on a column header to sort the grid. You might also want to change the width of the columns. Posts Table Pro will set this automatically based on the content of each column. But for a WordPress video gallery, you might want to make the video player column wider so that people can see your videos more easily. The first column (content) gets 40% of the table width – the biggest width to give more space for the embedded video player. The second column (title) gets 15% as the video titles don’t need much space. The third column (excerpt) is slightly wider to allow for more text. The final column (category) is also quite narrow. Add your videos in different ways – for example if you want to use the main content area for something else, you can embed videos as custom posts instead. Display other types of content as well as videos – for example you can use it as a WordPress image and video gallery plugin, or as a video and audio gallery with music playlists. Use the plugin knowledge base to find out what’s possible with Posts Table Pro and choose how to use it for your own WordPress video gallery. With so much flexibility, it’s easily the best video gallery plugin for WordPress. Once you’ve finished designing your video gallery, think about the other ways you can use Posts Table Pro on your site. For example, you can use it to create a WordPress document library. You can create a publications library or knowledge hub. If you have an events website, use it to make an events list. Make a blog posts index of content table for your website. List your consultants or members in a sortable member directory. Once you’ve got the WordPress table plugin, you can use it as many times as you like. Be creative and get more for your money by using WordPress tables in different ways! Posts Table Pro is compatible with WooCommerce, so if your videos are stored in WooCommerce products, you can still use Posts Table Pro. 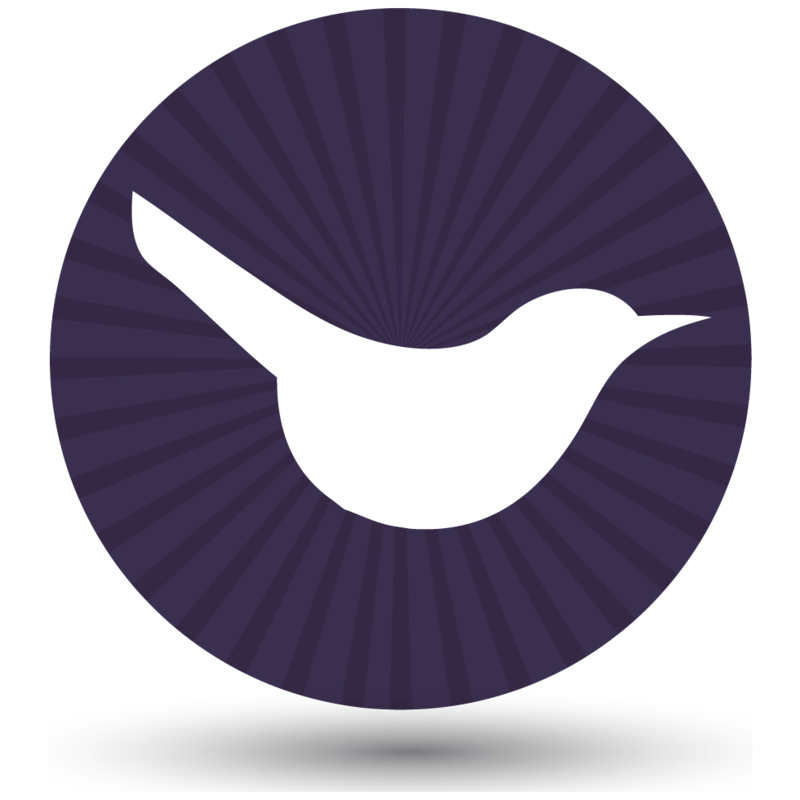 The advice in this tutorial equally applies to our WooCommerce Product Table plugin. If you want people to view videos and buy your products from the table, check out WooCommerce Product Table, as it may be even better at meeting your needs. Now that you know how to create a fully featured, fully responsive video gallery in WordPress, it’s time to get creative. To get started, download the Posts Table Pro plugin and follow the steps in this tutorial to set up your WordPress video gallery in no time at all. Don’t forget it’s simple to make the exact the video gallery you want, so have a play around and check out the knowledge base for even more ideas. Create your WordPress video gallery today!